Michigan Health Information Network Shared Services, the state entity that aims to improve health care quality, cost, efficiency, and patient safety through electronic exchange of health information, announced an agreement with HT Systems to provide the PatientSecure biometric identification solution for health care providers in Michigan. The agreement means health care providers in Michigan will have a low cost to deploy PatientSecure and sets the stage for integration with the Statewide Health Provider Directory and planned Patient Directory Services. 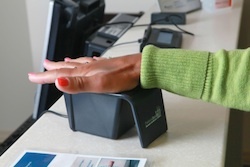 PatientSecure scans a patient’s palm vein pattern and links the patient to their medical record, providing accurate identification of every patient, preventing fraud and human errors, and reducing administrative cost of health care providers. The state’s evolving Health care IT Cyber Security program consists of the ability to conduct vulnerability assessments and continuous threat monitoring for health care networks. The offering enables organizations pursing the top level of vigilance when sharing data electronically to have high confidence their systems are achieving best practice levels of performance. PatientSecure has been adopted by more than 160 hospitals and hundreds of affiliated clinics and physician’s practices across the country More than five millions patients are currently enrolled in the PatientSecure system and tens of thousands of those same patients are successfully authenticated on a daily basis on return visits.